We work closely with associates and guides based in Seoul who can devise private tours of South Korea - perfect for family groups or friends traveling together! If you like the sound of one of our Group Tour suggestions, but would rather do it on a private basis just for you and your family, let us know and we'll send a quotation and itinerary. Simply let us know the day you will arrive and the number of days you wish to stay. Modern architecture and areas of pop culture, such as Gangnam, contrast with historic traditional structures in this vibrant city. Charming Seoul has gorgeous palaces, tempting restaurants, and stylish chic shopping outlets. 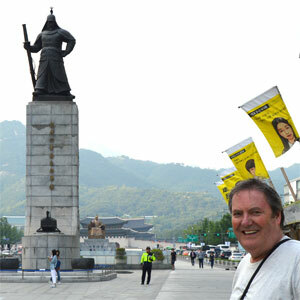 A fascinating region to visit, the DMZ gives an insight into the long-running conflict between North and South Korea. Look across into North Korea from the Observation Post, and experience history walking through the 3rd Infiltration Tunnel. Close to Seoul, Suwon is best known for its Hwaseong Fortress, with its solid stone walls, attractive archways, towers, and four pagoda style gates. Dating from the Joseon dynasty the fortress is a UNESCO world heritage site. In the peaceful and scenic Taebaek Mountains, Pyeongchang is most recently famed for having hosted Korea's Winter Olympic Games in 2018. Its National Park is a rambler's delight with pathways running between snow-capped peaks. Busan, the second largest city in South Korea is a city with expansive sandy beaches and modern high-rise buildings that contrast with traditional Buddhist temples. Boseong is the primary tea growing region of South Korea, where local women hand-pick the tea leaves in traditional terraced fields, which are surrounded by attractive hills. Off the south coast of Korea's mainland is the beautiful Jeju Island, where white sand beaches nestle within forests of pine trees, whilst other features include volcanic craters and lava caves. When submitting your Private Tour Enquiry, simply let us know the destinations you wish to include, the day you will arrive, and the number of days you wish to stay. Alternatively, select a suggested Group Tour Itinerary, but let us know that you would like to undertake the tour on a private basis.